[In the authors' words, “A weak pun on Multics”; very early on it was “UNICS”] (also “UNIX”) An interactive timesharing system invented in 1969 by Ken Thompson after Bell Labs left the Multics project, originally so he could play games on his scavenged PDP-7. Dennis Ritchie, the inventor of C, is considered a co-author of the system. The turning point in Unix's history came when it was reimplemented almost entirely in C during 1972—1974, making it the first source-portable OS. Unix subsequently underwent mutations and expansions at the hands of many different people, resulting in a uniquely flexible and developer-friendly environment. By 1991, Unix had become the most widely used multiuser general-purpose operating system in the world — and since 1996 the variant called Linux has been at the cutting edge of the open source movement. Many people consider the success of Unix the most important victory yet of hackerdom over industry opposition (but see Unix weenie and Unix conspiracy for an opposing point of view). See Version 7, BSD, Linux. Archetypal hackers ken (left) and dmr (right). Some people are confused over whether this word is appropriately ‘UNIX’ or ‘Unix’; both forms are common, and used interchangeably. 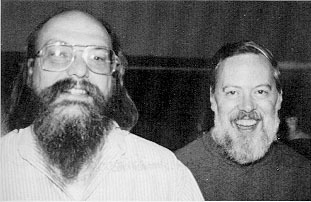 Dennis Ritchie says that the ‘UNIX’ spelling originally happened in CACM's 1974 paper The UNIX Time-Sharing System because “we had a new typesetter and troff had just been invented and we were intoxicated by being able to produce small caps.” Later, dmr tried to get the spelling changed to ‘Unix’ in a couple of Bell Labs papers, on the grounds that the word is not acronymic. He failed, and eventually (his words) “wimped out” on the issue. So, while the trademark today is ‘UNIX’, both capitalizations are grounded in ancient usage; the Jargon File uses ‘Unix’ in deference to dmr's wishes.